In the early 1980s in USA one solid blue longhair male kitten was born in a litter from a black domestic shorthair female and a shorthair Russian blue-type tom. This kitten was adopted by Cora Cobb who named him Siegfried. The next litter by the same parents also produced one longhaired solid blue kitten, this time a female. Cobb also adopted this kitten and named her Brunhilde. Cobb thought they might be the beginning of a new breed, and in 1986 Siegfried and Brunhilde produced a litter of three solid blue longhairs. 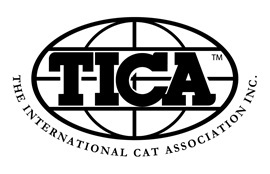 With the help of the genetic chair in TICA (The International Cat Association) the standard for Nebelung was written. It was almost identical to the Russian Blue, except the fur length. 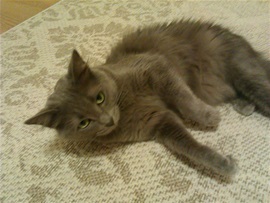 And TICA acepted the Nebelung for registration in Sept. 1987. The numbers of Nebelungs has since then slowly grown. In 1997 TICA granted Nebelungs Championship status. Nebelungs have also been bred in Russia, and have been imported to USA to strengthen the American lines and to widen the gene pool. There are also several Nebelung breeders in Europe now, but , as far as I know, I am the first and only Nebelung breeder in Norway at this time. The Nebelungs come in only one color, solid blue. The Nebelung has a reputation as a gentle, quiet cat, somewhat shy, but don’t get the wrong idea. This cat may have a reserved nature, but he loves to play (being especially fond of retrieving) and enjoys jumping or climbing to high places where he can study people and situations at his leisure before making up his mind about whether he wants to get involved. Guests will not receive his immediate attention and may never see him unless he decides they are worthy of his notice, but toward family members, especially his favored person, he is ever loyal, following them through the house and even riding on a shoulder. The Nebelung is a sensitive cat who doesn’t like to be ignored and will be hurt if he doesn’t receive the same amount of affection he gives. Lack of attention can cause him to become anxious or fearful. While the Nebelung loves your company, he is capable of entertaining himself during the day while you are at work. Unlike some active, intelligent breeds, he is not destructive but moves through the house with the lithe grace of a Russian ballerina. When you are at home, his subtle sense of humor and manual dexterity will never fail to entertain. Just make sure you laugh with him, not at him. He has a strong sense of self-worth and doesn’t like being made fun of. This is a cat who does best in a quiet, stable environment. He doesn’t like change, and it’s especially important to him that meals arrive on time. Count on him to be a faithful alarm clock in the morning, not so you don’t miss work but so he doesn’t miss a meal. If you take the time to develop a relationship with a Nebelung, your reward will be a deep bond with this loving cat. Both pedigreed cats and mixed-breed cats have varying incidences of health problems that may be genetic in nature. The Nebelung is generally healthy, however. An owner’s main concern will probably be this cat’s hearty appetite, which can turn him from sleek to stout in no time. The Nebelung’s long, dense coat should be combed twice a week to remove dead hair and distribute skin oils. Brush the teeth to prevent periodontal disease. Daily dental hygiene is best, but weekly brushing is better than nothing. Trim the nails every couple of weeks. Wipe the corners of the eyes with a soft, damp cloth to remove any discharge. Use a separate area of the cloth for each eye so you don’t run the risk of spreading any infection. Check the ears weekly. If they look dirty, wipe them out with a cotton ball or soft damp cloth moistened with a 50-50 mixture of cider vinegar and warm water. Avoid using cotton swabs, which can damage the interior of the ear. Keep the Nebelung’s litter box spotlessly clean. He is very particular about bathroom hygiene, and a clean litter box will help to keep his coat clean as well. It’s a good idea to keep a Nebelung as an indoor-only cat to protect him from diseases spread by other cats, attacks by dogs or coyotes, and the other dangers that face cats who go outdoors, such as being hit by a car. Russian Blues who go outdoors also run the risk of being stolen by someone who would like to have such a beautiful cat without paying for it. The Nebelung looks much like the elegant yet muscular Russian Blue, but with a thick, shimmering, medium-length coat. His general appearance is that of a long, sturdy, well-muscled cat. The International Cat Association breed standard for the Nebelung calls for him to have a modified wedge-shaped head that is more pointed than rounded, although his long hair may give the head a rounded look. Large ears are wide at the base with pointed tips, and rich, deep-green eyes have a slightly oval shape and are set wide apart. Kittens may have yellowish-green eyes, but by the time they are two years old they should have developed into the vivid green of maturity. The nose pad is charcoal gray. A long, slender neck sometimes looks shorter than it actually is because of the Nebelung’s dense fur. The body is what’s called semi-foreign, meaning it is moderate in shape, falling somewhere between the short, compact body of breeds such as Persians and the sleek angles of Oriental breeds such as the Siamese. It is athletic but not bulky, with a medium-boned body that is well proportioned. Supporting the body are long, medium-boned legs set on medium-size, well-rounded oval paws with generous tufting between the toes. The Nebelung looks as if he is walking on the balls of his feet. His tail is at least as long as his body from shoulder blades to rear end, covered in fur that is longer than the body hair. The Nebelung stands out for his luxurious coat and striking color. A medium-length double coat covers the body, increasing in length from the shoulder to the tail. Males have a distinct neck ruff, but females are not as well endowed. Behind the ears is feathering in a lighter shade of blue. Fur covering the back of the upper thighs gives the Nebelung the appearance of wearing pantaloons. The outer coat is fine and silky, topping an undercoat that is soft and downy. The coat typically does not develop fully until the cat is two years old. It is thicker, longer and softer in winter. To the uninformed, the Nebelung might look gray, but in cat show terms he is blue all the way to the roots. It’s ideal if the fur is silver-tipped, which makes the coat seem to glisten, but often silver tipping is noticeable only on the head and shoulders. Some Nebelung kittens are born with “ghost stripes,” a reminder of the tabby gene that all cats carry, even if it isn’t expressed in their coat, but these generally fade, leaving the cat with the solid blue coat of maturity. With children and other pets. Nebelungs have a tolerant nature toward children who treat them kindly and respectfully, but they can be wary of younger children who pet them clumsily. Always supervise very young children when they want to pet the cat. The Nebelung is accepting of other animals, including dogs, as long as they aren’t chased or menaced by them. Introduce pets slowly and in controlled circumstances to ensure that they learn to get along together.